Alesis have really been taking the electronic drumming world by storm in recent years. The Alesis Strike Pro kit further cements their position in the market, by offering a very advanced kit in a price range that was previously dedicated to very mid-level sets. 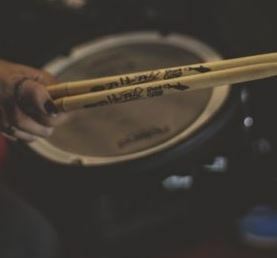 Most people that have played electronic drums sets knows how versatile they can be, both in terms of performance and music genres. In one of our previous reviews, we talked about the Alesis Nitro kit. This is the entry level kit by Alesis. However, today we’re going to talk about a much more advanced option: the Alesis Strike Pro Kit – a professional electronic drum set that consists of eleven elements. We’ll see how they benefit the player and what makes this kit adaptable to modern drumming environments. This 11-piece set contains everything you need for professional performances. Thanks to its mesh heads, all the pads in this electronic drum set provide you with a nice drumming feel. So, what we have in this kit is the 14-inch kick drum pad and the 14-inch snare drum pad. The snare drum pad is the dual-zone one, so you can expect a high level of responsiveness from this electronic snare. Then we have four tom pads. They come in four different sizes: 8”, 10”, 12” and 14”. The tom pads are also dual-zone pads, so you can rest assured that your tom fills and roll will resonate well with the audience at your gigs. The cymbal department has three representatives in the Alesis Strike Pro kit: the 12” mobile hi-hat cymbals, the 14” dual-tone crash cymbals and the 16” ride cymbal with the triple-zone features. This entire drumming regiment supervised by the Strike Performance Module. Every single element has to be connected to this device. What’s great about it is the 4.3 LED screen that enables smooth use of the module. Of course, the quality of drumming depends on rack, as well. That’s why the guys from Alesis have provided a top-notch, 4-post rack made of chrome, as well as a double-braced stand for the snare. The main advantage of the Alesis Strike Pro kit is the fact that it gives you a traditional drumming sensation, while providing a wide range of high-tech options. You don’t have to be afraid that your kick on the snare drum will might not be loud or natural enough. Since those pads have mesh heads, everything you play sounds genuine and real. 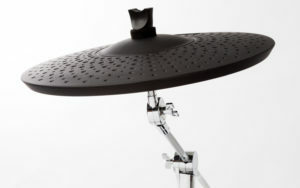 The cymbals represent a great match of natural bounce, player’s control and smooth feel. Further, when you hit the snare, the cymbals or the toms, you get the sound of equal quality. This is also due to the quality of the materials used for manufacture. 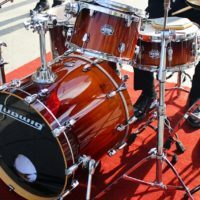 The drum shells of this set were made of top-notch wood. Because of these natural elements, they don’t lose any traditional drumming features, but quite the opposite – you get the feeling that you’re playing a premium traditional piece. The Strike Performance Module is a handy playing-enhancing device that is a big upgrade to any lower end Alesis kits. You can use the variety of 1600 samples and 100 drum kits. These options make this module a perfect electronic brain for your drumming sessions. It’s possible to pre-record the samples and kits you might need for your gig, or insert your own playing patterns or rhythms. There’s a slot for a memory card on the device, so there’s no obstacle to bring your own samples to your concerts or gigs. Also, the software editor is another great perk of the Strike Performance Module. 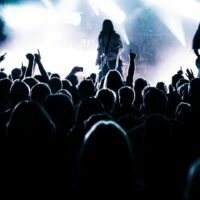 You can use this feature to record your own instruments or drumming kits, as well as for including imported music files for your playing sessions. There are plenty of input ports at the back of this device, which is a great playing advantage. Also, the total of eight separate outputs provides a vast number of options for recording on different channels for recording or gigging. Still, make sure that you always update the latest version of the module firmware. The guys from Alesis are doing a great job with innovative and practical updates and downloading them as they’re released will help you improve your playing experience. The mesh pads, the wooden drum shells, the premium rack and the massive snare stand all contribute to the high quality of the sound you get when you’re playing the Alesis Strike Pro kit. It’s important that you can adjust some settings on the Strike Performance Module and on the components themselves. By doing this, you’ll be able to get some more sophisticated sound nuances. You can learn more about these settings in this tutorial. Top-notch natural sound – The pads are enriched with mesh heads and the shells are made of wood, which all add to the high-class quality of sound you obtain from this kit. Dual-zone drums – The snare drum and the tom toms are all dual-zone drums, which adds to the genuine drumming feel of the Alesis Strike Pro kit. 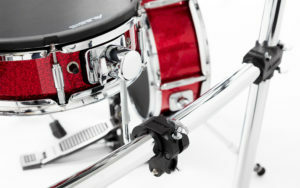 Durable metal stands – The rack and the snare stand are made of premium metal, which is a guarantee that they’ll remain fixed throughout the gigs of any duration. 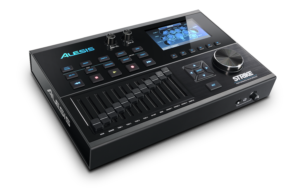 Strike Performance Module – The trademark of Alesis, this device will raise the already great playing experience to a high production level. Hi-hat adjustment – It’s been reported that it takes a lot of time to adjust the hi-hat settings and even then it might not be what you’ve hoped for. Great set – but not the best on the market – The Alesis Strike Pro is a great piece of kit for its price range, but it still doesn’t measure up to flagship products by Roland or Yamaha. See our electronic drum set reviews article for more information. That said, it’s thousands of dollars cheaper! This is a visually and sonically attractive electronic drum kit that can meet the production and playing demands of professional performers. The Alesis Strike Pro is definitely is a great buy for professional drummers that are on a lower budget, since it’s a great value for money. We recommend that you try it yourself and see why many drummers heap praises on the Alesis Strike Pro.